DUPLI-COLOR Rust Protective Primer has corrosion- and rust-preventing properties for the following paintings. Alcyd-based. 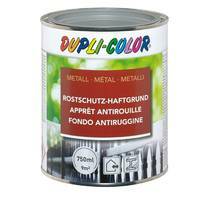 Ideal suitable as previous coat on metal in indoors and outdoor premises. Applicable on iron, steel, zinc. The surface has to be dry, clean and free from fat and rust. Zinc-plated surfaces should be cleaned with a zinc cleaner or a household-cleaner (e.g. spirits auf ammonia). Remove old flaking paintings which are not bearing. Before application, always carefully stir up the paint. Temperature of the object and surrounding temperature should be at least +7°C. Prime coat with this primer. Final coat with a undiluted synthetic paint. Before you apply a final coat, slightly sand and clean the ground. Cleaning of tools immediately after use with a brush cleaner.